Shinagawa is now one of the busiest city centers of Tokyo. Since the time Shinkansen started to stop at Shinagawa station in 2003, Shinagawa became the gate to Tokyo for the people coming from the western Japan. In the same year the first office buildings in Shinagawa east were completed under a new development plan and many office workers started to work in Shinagawa. The expansion of Shinagawa continues till now. Therefore, when we hear about the place name Shinagawa, we automatically think about the area surrounding the JR Shinagawa station. However, this is a sort of misunderstanding. The original Shinagawa, the first post-town during the Edo period (1603-1867) on the Tokaido highway from Edo (present Tokyo) to Kyoto, exists far in the south from the Shinagawa station. The source of misunderstanding was that the Shinagawa station of the first Japanese railway line happened to be built in the Takanawa district. Therefore, when we go westwards from Shinagawa station, we go through the Takanawa exit. Around Shinagawa station railroad extends parallel to the Route 15, a part of Tokaido. After leaving the Shinagawa station, turn right, walk a few minutes along the busy Route 15 and turn left, then we can see the main gate of Tozenji temple at the end of a slope. The British consulate was built within the grounds of Tozenji temple on 6th July 1859 (1). The US, which concluded the earliest treaty with Japan, however opened a legation in the same year in Zenpukuji a month later than the opening of the British consulate. (1) Consul General Rutherford Alcock promoted to Minister at the end of 1959. The opening of the country to the Western countries, which started with the first treaty with the US in 1853, resulted in the inflation and aggravation of living conditions in Japan. This added fuel to the anti-foreign sentiments and the movement to overthrow the Tokugawa Shogunate. In 1860 the Japanese Chief Minister Ii Naosuke, who was promoting the opening policy, was assassinated by a group of anti-foreign samurai. 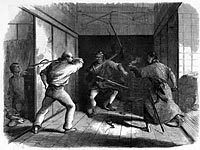 In January 1861 the interpreter of the American legation Henry Heusken was assassinated by another group of anti-foreign samurai. The political climate became tense. On 28th May 1861 Tozenji was attacked by a dozen of extremist samurai. Minister Alcock could barely escape from the attack, but two of his aids were seriously wounded and some among the Japanese guards and attacking samurai were killed. A year later, in the absence of the Minister, the Consulate was again attacked by anti-foreign samurai and two British sailors were killed. Tozenji was reconstructed around 1930 and only a part of the temple keeps the original construction when the British legation was here. 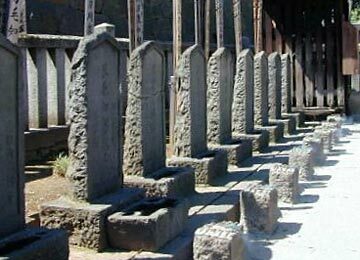 However, timbers and other materials were further used after the reconstruction and sword cuts at the time of attacks are still seen here and there on the pillars. Tozenji is kept clean and quiet, as religion is here practiced and alive. 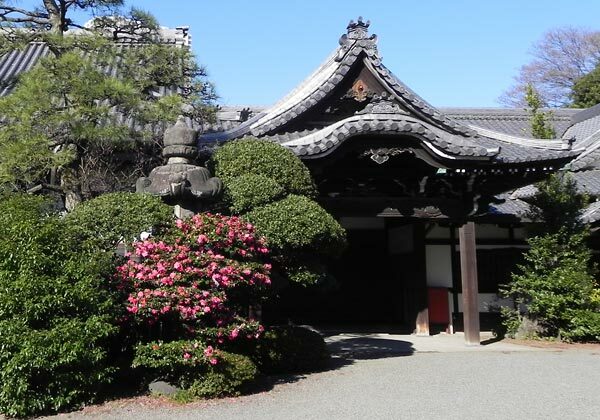 The temple is not open for tourism, though visitors are allowed to enter its front garden and enjoy the peaceful quietness not far from the turbulence of Shinagawa station. This gate witnessed the incident in 1861. Tozenji is only about a hundred meter off Tokaido at the foot of plateau. The present Tokaido was developed during the course of the Edo Period and in the earlier time Tokaido existed on the plateau. When Tokugawa Ieyasu (1543-1616) moved into Edo in 1590, he used this old Tokaido which is now called "Nihon-enoki Dori" (2). (2) "Enoki" is a large tree celtis sinensis. There stood two large enoki trees in the Edo period and the street was named after them. The area along Nihon-enoki Street was once a temple district. 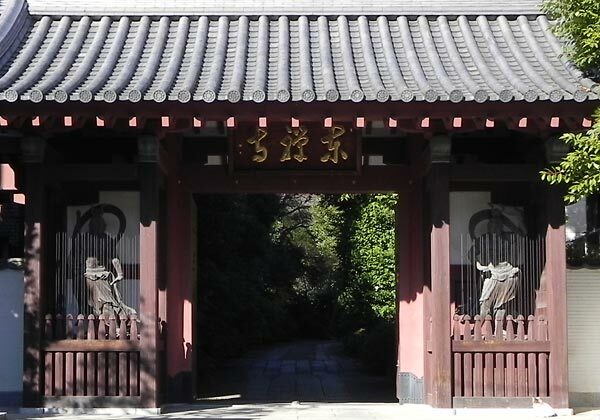 There are numerous temples along the street, though they are nowadays hidden behind luxury apartment buildings. and served by the temple. Kofukuji is one of the temples in the district and its "Yurei Jizo" (3) is eagerly worshipped. Related to this Jizo there is a tradition about a mother and a child who used to buy candy at a nearby shop. When people followed them they always disappeared at a Jizo statute. Therefore, a priest held a memorial service to the Jizo, and they stopped visiting the candy shop. 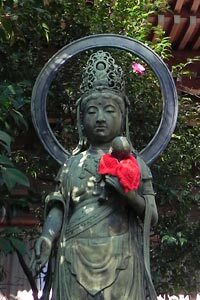 The same Jizo statute was also said to take care of the children who had lost their mothers. In fact the child mortality rate was very high in the past and the parents built Jizo statute to console the spirit of their dead children, as Jizo is a deity to protect children. (3) "Yurei" means ghost and according to the traditional understanding they are spirits of the dead persons which linger around this world, because they are much concerned about something in this world. It is also believed that yurei have no legs and hover in the air. 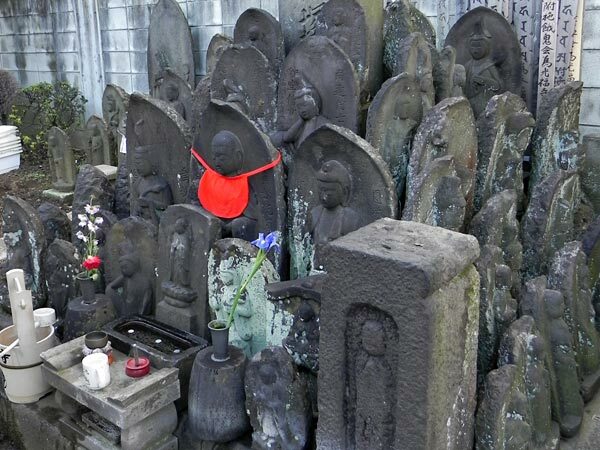 The stone statute of Yurei-jizo has indeed a very bizarre shape and might have made people associate it with ghost. I presume that one of the stone statues of Jizo eroded after years of rain and wind and took such a shape. Anyhow, this shape of the statute might have given a very strong impression to the people in the Edo period to create a story about a mother and her child. Even now this Jizo is worshipped by many people and is kept under a small house. View of the Nihon-enoki fire station from the west. 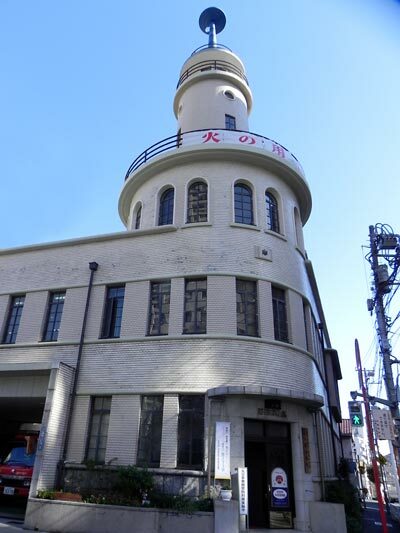 Not far from Kofukuji, we can find an interesting building of Nihon-enoki Fire Station. This building was constructed in December 1933 under the influence of German impressionism. Its round outer wall, though relatively small, reminded me of brick buildings constructed in the early 20th century in Germany and other European countries. As I used to live in Berlin I immediately associated Nihon-enoki Fire Station with Schaubühne am Lehniner Platz in Berlin which was designed by Erich Mendelsohn (1887-1953). Nihon-enoki Fire Station was designed by Miso Ochi, who was an engineer in the building and repairs section of the National Police Agency. I do not know about him other than his name, because he was only one of the ordinary governmental officials. It is all the more surprising to me that an engineer of the Police Agency had an idea about the most advanced trend of building design in Europe in the 1930s. 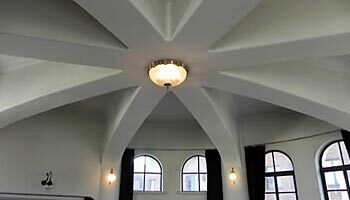 The ceiling of the second floor has a special deign using timber beams. 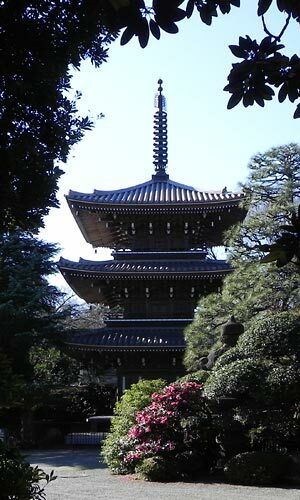 The most famous institution in this area is definitely Sengakuji temple. Sengakuji was originally built by Tokugawa Ieyasu, the founder of Tokugawa Shogunate. 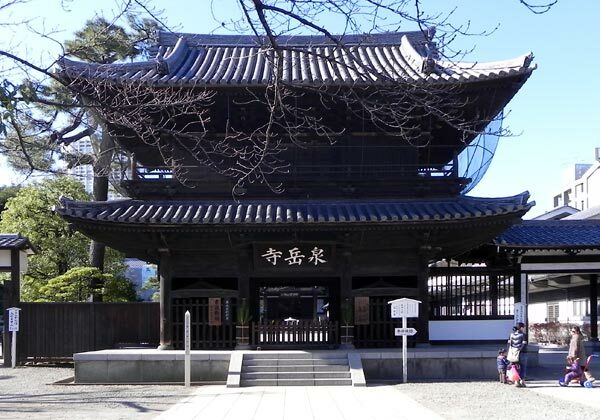 After the great fire in 1641, it was moved to the present place and reconstructed with the support of six feudal lords including the family Asano. All forty-seven samurai have their place for joint repose in the cemetery of Sengakuji. Several decades later, the then Lord Asano was sentenced to commit "seppuku", because he tried to assault another feudal lord Kira in the Shogun’s palace. The domain of Asano was dissolved. However, among his retainers who were left jobless, forty-seven samurai succeeded in revenge and they were later ordered by the Shogunate to commit "seppuku". Lord Asano and forty-seven samurais were all buried in the cemetery of Sengakuji, as the temple was supported by the lord. The story about the revenge of forty-seven samurai was taken up by Kabuki Theater a half century later under the title of "Chushingura". Chushingura became a great hit. The loyalty of the forty-seven samurai was then promoted by the imperial government. Chusingura was banned from the stage by the democratically oriented occupation army after WWII, but after its rehabilitation the boom continues to this today. Sengakuji became the destination of Chushingura fans. There are even Chushingura souvenir shops along the approach to Sengakuji. 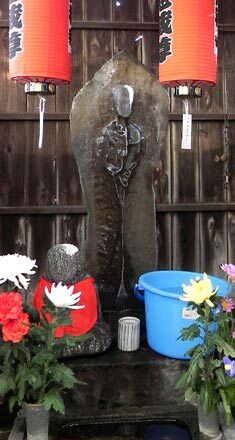 A high statue of the leader of the forty-seven samurai Oishi Kuranosuke was placed beside the entrance of the temple yard. The number of visitors is especially large in December, the month of vengeance and the smoke of incense offered by visitors.